Buy Othello and PriceWatch, Buy this board game at the Lowest Price. 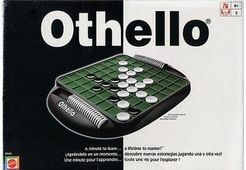 Othello game board has 64 squares, plus storage compartments with roll-down covers on both sides for discs. To outflank your opponent and flip your opponent's discs to your color, ending up with the majority of discs on the board in your color. TO OUTFLANK means to place a disc so that you have a disc of your color at each end of an opponent's row of discs of his color. Each player chooses one color to use throughout the game. Black places two black discs, and White places two white discs on the board. The game always begins with this set-up and players choose who goes first. A move consists of taking a disc from the compartment and placing it so that it completes the outflanking of one or more opposite color discs, then flipping the outflanked disc(s) over to your color. A player must always outflank his opponent and flip at least one opposing disc in order to move. If he cannot make a move, he loses his turn and his opponent moves. A disc may outflank any number of opposing discs in one or more rows. (A row may be one disc or many discs in a straight line). A disc may outflank in any direction: horizontal, vertical, diagonal, forward or backward. A disc may outflank in any number of directions at the same time. (Theoretically, it is possible to flip in up to 8 directions at once). Discs may only be flipped as a direct result of a move. The game is over when the board is entirely filled with discs, or when it is not possible for either player to move (i.e., out flank an opponent's row and flip an opponent's disc), or when the board is filled (or partially filled) with all one color. At this point, discs are counted up. The player with the most discs is the winner. It is not necessary to flip a complete row of discs-however all discs outflanked in any one move must be flipped. It is not permitted to place a disc that does not immediately flip an opposing disc. Once placed, a disc is never moved to another square on the board. (It may, of course, be flipped over, but it always remains on that square). If it is not possible to place a disc that will flip an opposing disc, the player must pass and forfeit that one turn. If a player runs out of discs, but still has a turn and an opportunity to place a disc, the opponent must give that player a disc. (This holds true for as many times as a player needs, and can use, a disc). If a player makes an incorrect move, and the opponent has not gone yet, the discs may be corrected. If the opponent has already gone, it is too late and discs remain as if the move was a correct one.